Schematic representation of the epoch comparisons used in the present analyses. E0 indicates time before emotional response; B1, baseline 1; E1, time immediately after emotional response; E2, final period of viewing of scenario; and B2, baseline 2. The periods represented by white bars are compared with the periods represented by black bars. A dashed line indicates the onset of emotional or motivational response as reported by button press. Functional magnetic resonance images comparing brain activity differences in pathological gambling (PG) subjects (n = 10) and control subjects (n = 11) during viewing of the initial portions of videotapes, before subjective emotional or motivational response. Brain activation comparison maps are shown for PG subjects–control subjects when viewing gambling (A), sad (B), and happy (C) scenarios at the P<.005 threshold. Red/yellow indicates areas of relatively increased activity and blue/purple indicates areas of relatively decreased activity in PG subjects vs controls during viewing of the initial portion of the scenario vs the baseline period before viewing (E0-B1). The left side of the brain is displayed on the right side of each image. See the "Data Analysis" subsection of the "Methods" section for temporal definition of the epoch E0-B1. Functional magnetic resonance images comparing brain activity differences in pathological gambling (PG) subjects and control subjects after the reported onset of emotional or motivational response. Brain activation comparison maps are shown for PG subjects–control subjects when viewing gambling (10 PG subjects and 10 controls) (A), sad (5 PG subjects and 8 controls) (B), and happy (8 PG subjects and 9 controls)(C) scenarios at the P<.005 threshold. Red/yellow indicates areas of relatively increased activity and blue/purple indicates areas of relatively decreased activity in PG subjects vs controls during viewing of the scenario after vs before the reported onset of emotional or motivational response (E1-E0). (See the "Data Analysis" subsection of "Methods" section for temporal definition of the epoch E1-E10.) The left side of the brain is displayed on the right side of each image. Functional magnetic resonance images comparing brain activity differences in pathological gambling (PG) subjects (n = 10) and control subjects (n = 11) during viewing of the final portions of videotapes. Brain activation comparison maps are shown for PG subjects–control subjects when viewing gambling (A), sad (B), and happy(C) scenarios at the P<.01 threshold. Red/yellow indicates areas of relatively increased activity and blue/purple indicates areas of relatively decreased activity in PG subjects vs controls during viewing of the final portion of the scenario vs the baseline period after viewing(E2-B2). (See the "Data Analysis" subsection of the "Methods" section for temporal definitions of the epoch E2-B2.) The left side of the brain is displayed on the right side of each image. Background Gambling urges in pathological gambling (PG) often immediately precede engagement in self-destructive gambling behavior. An improved understanding of the neural correlates of gambling urges in PG would advance our understanding of the brain mechanisms underlying PG and would help direct research into effective treatments. Methods Echoplanar functional magnetic resonance imaging was used to assess brain function during viewing of videotaped scenarios with gambling, happy, or sad content. Participants rated the quality and magnitude of their emotional and motivational responses. Results Men with PG (n = 10) reported mean ± SD greater gambling urges after viewing gambling scenarios vs control subjects (n = 11) (5.20 ± 3.43 vs 0.32 ± 0.60; χ21,19 = 21.71; P<.001). The groups did not differ significantly in their subjective responses to the happy (P = .56) or sad (P = .81) videotapes. The most pronounced between-group differences in neural activities were observed during the initial period of viewing of the gambling scenarios: PG subjects displayed relatively decreased activity in frontal and orbitofrontal cortex, caudate/basal ganglia, and thalamus compared with controls. Distinct patterns of regional brain activity were observed in specific temporal epochs of videotape viewing. For example, differences localized to the ventral anterior cingulate during the final period of gambling videotape viewing, corresponding to the presentation of the most provocative gambling stimuli. Although group differences in brain activity were observed during viewing of the sad and happy scenarios, they were distinct from those corresponding to the gambling scenarios. Conclusions In men with PG, gambling cue presentation elicits gambling urges and leads to a temporally dynamic pattern of brain activity changes in frontal, paralimbic, and limbic brain structures. When viewing gambling cues, PG subjects demonstrate relatively decreased activity in brain regions implicated in impulse regulation compared with controls. CLASSIFIED AS an impulse control disorder,1,2 pathological gambling (PG) has been described as a drug-free addiction and an obsessive-compulsive spectrum disorder.3 As in other impulse control disorders, substance use disorders (SUDs), and obsessive-compulsive disorder (OCD), urges generally precede engagement in associated self-destructive or interfering behaviors and consequently represent important targets for therapeutic interventions.4,5 Although, to our knowledge, no study has investigated neural correlates of urges in an impulse control disorder, studies of SUDs and OCD have identified brain contributions related to anticipatory states. Symptom provocation in OCD leads to increased activity in cortico-basal-ganglionic-thalamic circuitry,6 and cue-elicited cocaine cravings are associated with limbic activation, for example, in anterior cingulate (AC).7,8 Identifying neural correlates of gambling urges in PG should not only improve the understanding of the relationship among PG, SUDs, and OCD but also help develop effective treatments for PG. Based on higher rates of co-occurrence for PG and SUDs than for PG and OCD9 and greater hedonic contributions to anticipatory states in PG and SUDs compared with OCD, we hypothesized that neural correlates of gambling urges in PG would be more similar to cocaine cravings than to OCD urges; that is, they would involve excessive limbic activities rather than increased cortico-basal-ganglionic-thalamic activities. Thirteen control subjects and 14 men with PG provided written informed consent and participated in this study, which was approved by the Yale Human Investigations Committee. All participants were recruited via advertisements. Technical problems (eg, loss of data and excessive participant motion) led to the removal of 2 controls and 4 PG subjects. Participants were right-handed men, aged 18 to 65 years, native English speakers, and without a history of major neurologic injury or illness. All PG subjects met the criteria for PG2 and were free of other active Axis I disorders except nicotine dependence. Control subjects were free of Axis I disorders except nicotine dependence and had South Oaks Gambling Screen scores of 0. All control subjects reported having gambled. The Structured Clinical Interview for DSM-IV was used for PG subjects, and the nonpatient version was used for control subjects.10 We also administered the Structured Clinical Interview for Pathological Gambling (M.A.S., M.N.P., and B.J.R., unpublished data, 1998). The groups did not significantly differ in mean ± SD age (PG subjects: 36.20 ± 11.95 years; controls: 30.09 ± 7.71 years; χ21,19 = 1.99; P = .17) or smoking status according to mean ± SD Fagerstrom Test for Nicotine Dependence scores (PG subjects: 2.10 ± 2.81; controls: 0.46 ± 1.51; χ21,19 = 2.88; P = .19). Smoking status was assessed because nicotine dependence was the only non-PG active Axis I diagnosis not excluded and because many PG subjects smoke.11 Three PG subjects and 1 control were nicotine dependent (Fagerstrom Test for Nicotine Dependence score ≥5). All participants graduated from high school. The PG group consisted of 4 African Americans and 6 whites, and the control group consisted of 1 African American and 10 whites. Mean ± SD South Oaks Gambling Scale scores were 12.60 ± 4.27 for PG subjects and 0.00 ± 0.00 for controls (χ21,19 = 96.11; P<.001). The Zuckerman-Kuhlman Personality Questionnaire12 and the NEO Personality Inventory–Revised13 were administered. Men with PG met the criteria for past diagnoses (not active for ≥3 months) as follows: 2 for marijuana abuse, 1 for alcohol and cocaine abuse, 1 for alcohol abuse and major depression, 1 for alcohol abuse and cocaine dependence (CD), and 1 for alcohol dependence and CD. Participants denied psychoactive drug use, except for nicotine or caffeine, for 72 hours before functional magnetic resonance imaging (fMRI). None had structural MRI abnormalities. Scenarios were generated as described previously.8 Two young actors each created happy, sad, and gambling scenarios. The sad scenarios describe parental divorce and a relative's death, and the happy scenarios describe an unexpected visit from a relative and a wedding. The gambling scenarios incorporate psychological cues and involve casino gambling forms that are commonly problematic for men (cards or dice).14 Each scenario includes general cues for gambling: a perceived stressor (problems at work or at home), expressed frustration regarding the stressor, a period of "free" time, and receipt of unexpected money (a check or bonus). Each actor shows the viewer the money or check and describes going to the casino. The actor describes driving to and walking through the casino, obtaining chips, going to a table, and the feeling of gambling, emphasizing the excitement. To enhance cue elicitation, one scenario includes a related 20-second gambling clip (dice scenario) after the actor's descriptions. In all of the videotapes, the actors talk directly to the camera, simulating a social interaction between the actor and the viewer. The happy, sad, and gambling scenarios were organized in 2 counterbalanced orders, with essentially half of each participant group receiving the videotapes in each order (order 1: GA, SB, HA, GB, HB, SA; order 2: SB, GA, HB, SA, HA, GB).8 Each scenario is 3.0 to 4½ minutes long and is preceded and followed by 45 seconds of gray-screen illumination to provide before and after baselines for each imaging sequence. Data from 1 happy, 1 sad, and 1 gambling scenario each from 3 PG subjects were not analyzed because the scenarios involved actresses performing alternate scripts. Because anticipatory states such as gambling urges share features of emotions (temporally dynamic, individually defined, and internal experiences), happy and sad induction states were used as active control conditions.8 For each scenario, participants were instructed to push a button at the onset of an emotional (eg, happiness, sadness, or anger) or motivational (eg, desire to eat, drink, or gamble) response, facilitating definitions of epochs based on individual emotional experience.8 After each scenario, participants described the quality and rated the peak and average intensities of their emotions and motivations (including gambling urges) using visual analog scales from 0 to 10 (0 indicates no; 1-3, mild; 4-7, moderate; and 8-10, intense emotional and motivational responses). Between-videotape rests of 2½ minutes were used, a duration found to be sufficient for induction of distinct emotional states from one scenario to the next.8,15 Before and after fMRI, particiants completed a Gambling Urge Questionnaire (M.N.P. and S. S. O'Malley, PhD, unpublished data, 1998), modified from the Alcohol Urge Questionnaire, to assess changes in urges. If a participant scored higher after fMRI, a researcher debriefed him using successive questionnaire administrations to assess urges. Men with PG were provided referral information and were encouraged to seek treatment. Images were obtained using a 1.5-T MRI system equipped with an echoplanar imaging system (GE Signa; GE Medical Systems, Milwaukee, Wis), a standard quadrature head coil, and a T2*-sensitive gradient-recalled, single-shot, echoplanar pulse sequence.8,16 Conventional T1-weighted spin-echo sagittal anatomic images (echo time, 11 milliseconds; repetition time, 667 milliseconds; field of view, 24; slice thickness, 5 mm; 256 × 128 × 1, number of excitations) were obtained first for slice localization. Next, 12 T1-weighted oblique-axial slices (echo time, 13 milliseconds; repetition time, 500 milliseconds; field of view, 40 × 40 cm; 256 × 192 × 1, number of excitations) were obtained parallel to the plane transecting the anterior and posterior commissures, covering the entire brain, to serve as underlays for functional images acquired at the same locations. Functional images were obtained using a single-shot, echoplanar–gradient echo sequence (repetition time, 1500 milliseconds; echo time, 60 milliseconds; flip angle, 60°; matrix, 64 × 64; field of view, 20 × 20 cm; slice thickness, 8 mm; skip, 1 mm; number of images per slice, 240) at the same locations. Data were motion corrected for 3 translational directions and 3 possible rotations.17 Runs with motion in excess of 1.5 mm of displacement and 2° of rotation were rejected. Corrected images were spatially filtered using a Gaussian filter with a full-width half-maximum of 6.5 mm. Changes in the echoplanar imaging signal were evaluated in 3 pairs of successive epochs (Figure 1 and Table 1).8 The first comparison is between the initial period of scenario viewing before onset of subjective emotional response (E0) and the 45-second baseline period before scenario viewing (B1). The second comparison is between the initial period of scenario viewing after onset of subjective emotional response (E1), up to 45 seconds in duration and as determined by time of button press, and the immediately preceding period of scenario viewing before the self-reported onset of emotion (E0). The third comparison is between the final 45 seconds of scenario viewing independent of emotional response (E2) and the baseline period after scenario viewing (B2). To maintain sufficient comparability among participants in data sampling, comparisons were not made if any epoch was less than 15 seconds, and only images acquired during the first or last 45 seconds of long epochs were considered. Total scores on the Zuckerman-Kuhlman Personality Questionnaire were higher for PG subjects than for controls (Table 2). The most robust between-group differences involved impulsive sensation seeking, with greater impulsiveness and sensation seeking associated with PG. The only major personality cluster on the NEO Personality Inventory–Revised distinguishing PG subjects and controls at P<.05 was that of neuroticism. Of the neuroticism subcategories, the greatest between-group difference was in impulsiveness. Subjective responses to sad and happy scenarios were generally moderate and similar in controls and PG subjects (Table 3). Although occasionally a participant did not report a response to a scenario, no participant reported sad emotions during the happy scenarios or happy emotions during the sad scenarios. Control subjects were interested in the gambling scenarios and reported comparatively robust (compared with the happy and sad scenarios) and varied emotional responses described as curiosity, disgust, or pity. Subjective response to the gambling scenarios was generally more robust in PG subjects than in controls. The greatest differences were observed in reports of gambling urges in response to the gambling scenarios. None of the PG subjects described gambling urges during the viewing of the sad or happy scenarios, but all 10 reported gambling urges when viewing the gambling scenarios. Three of 11 control subjects reported gambling urges when viewing a gambling scenario. Because cue-elicited states demonstrate temporally dynamic patterns, we generated comparisons of temporal epochs (Figure 1), some of which are tied closely to and others of which are largely or totally independent of subjective responses.8 Specifically, we predicted that individual epochs of gambling videotape viewing would demonstrate unique neural correlates related to (1) early responses, before subjective awareness of internal state change; (2) middle responses, linked to onset of awareness of state change; and (3) late responses, around the time of presentation of the most provocative stimuli.8 The E0-B1 comparison identifies activity changes in the initial period of videotape viewing, before subjective response, and is largely independent of subjective response. The E1-E0 comparison focuses on activity changes around the time of onset of reported emotional and motivational responses and is critically dependent on button press information. The E2-B2 comparison is independent of subjective response and focuses on activity changes during the final period of viewing. During initial viewing of the gambling scenarios, PG subjects demonstrated significantly less brain activity than controls (Figure 2A and Table 4). Relative decreases bilaterally in the cingulate gyrus (z = 40) in PG subjects were accounted for by decreased activity in PG subjects. There was decreased activity involving the precuneus and right inferior parietal lobule (z = 40 and 32, respectively) attributable to increased activity in controls and decreased activity in PG subjects. Between-group differences in activity in right (z= 40, 32, and 24) and left (z = 40) precentral and postcentral gyral regions were due mainly to increased activity in control subjects. Relatively decreased activity in PG subjects in the right superior frontal gyrus (z = 32) was accounted for by increased activity in controls and decreased activity in PG subjects. Relatively decreased activity in PG subjects was observed in the left superior frontal gyrus (z = 32), accounted for by a decrease in activity in PG subjects. Differences in lateral regions of the inferior frontal gyrus (lateral orbitofrontal cortex [OFC]) were attributable to increased activity in controls (z = –4). Significant differences were also demonstrated in right and left deep gray matter nuclei (z = 12 and 4, respectively; in the region of caudate, basal ganglia, and thalamus; mainly increased in control subjects, some decrease in PG subjects). During the E0-B1 portion of sad videotape viewing, no between-group differences were noted at P<.005 (Figure 2B). During the corresponding epoch of the happy scenarios, PG and control subjects showed a likely artifactual difference due to increased signal activation over white matter in the internal capsule in controls (Figure 2C). Together, these data demonstrate relatively decreased activations in frontal cortical, OFC, basal ganglionic, and thalamic regions in PG subjects compared with controls during the initial period of videotape viewing of the gambling scenarios specifically. These activity differences were observed during presentation of multiple general cues associated with gambling and occurred before subjective awareness of changes in emotional or motivational state. Individuals with PG showed relatively increased brain activity during E1-E0 compared with controls (Figure 3 and Table 4). When viewing the gambling scenarios, relatively increased activity was seen involving the right cuneus and right middle occipital gyrus (z = 24; increased in PG subjects and decreased in controls) and bilateral (predominantly left) cuneus (z = 24; increased in PG subjects and decreased in controls) (Figure 3A). During the corresponding epoch of sad videotape viewing, no significant between-group differences were observed (Figure 3B). The E1-E0 between-group comparison for viewing of the happy scenarios demonstrated relatively increased activity in the left superior frontal gyrus (z = 40) attributable to increased activity in PG subjects (Figure 3C). Relative increases in right ventral striatum and posterior orbitofrontal gyrus (z = –4) and left inferior frontal gyrus (z = –4) were attributable to decreased activity in controls. Overall, when between-group differences were observed for the E1-E0 comparisons, PG subjects demonstrated relatively increased activity compared with controls in brain regions previously implicated in emotional and motivational responses. No significant differences were observed in brain activity responses to the gambling scenarios during the E2-B2 epoch between PG and control subjects at the P<.005 threshold (data not shown). At a threshold of P<.01, comparison signal change maps revealed that the only brain region distinguishing PG subjects from controls in the E2-B2 epoch of gambling videotape viewing was the ventral AC (vAC)(z = –4; decreased in PG subjects and increased in controls) (Figure 4A and Table 4). At the same threshold for the same epoch of viewing of the sad scenarios, differences were observed in the right inferior frontal gyrus (z = 24; increased in controls and decreased in PG subjects) and in the right superior frontal gyrus (z = 4; decreased in controls) (Figure 4B). The E2-B2 between-group comparison signal change maps for the happy scenarios identified no differences between PG subjects and controls (Figure 4C). The findings that the neural correlates of cue-elicited anticipatory states in PG differ significantly from those of OCD are consistent with our initial hypothesis. The finding of decreased activity in the vAC in PG subjects differs from findings of studies7,8 of cocaine cravings and our initial hypothesis and suggests that PG shares a close relationship with nondrug disorders characterized by impaired impulse control. Given the clinical importance of anticipatory urges in PG (eg, often occurring immediately before engagement in gambling and leading to relapse), an understanding of the neural correlates of gambling urges has significant potential in the development of more effective prevention and treatment strategies for PG. Consistent with previous studies2,20-26 and its classification, PG was associated positively with impulsiveness and impulsive sensation seeking. Although a study27 of limited sample size has not found a similar association, the findings from the present study and multiple previous investigations2,20-26 provide strong evidence that men with PG are more impulsive and sensation seeking than comparison subjects. As in real-life situations, videotaped cues present a complex array of information that can be experienced and interpreted uniquely by individuals. Individuals with PG and control subjects showed little difference in the magnitude or quality of their subjective responses to the sad or happy scenarios. Similarly, no differences were observed in subjective responses of CD and control subjects to happy or sad videotapes.8 Similar to CD and control subjects viewing cocaine scenarios, when viewing the gambling scenarios, control subjects were more likely to report annoyance, pity, or disgust and PG subjects were more likely to report excitement or the urge to gamble.8 The intensities of the emotional and motivational responses to the gambling videotapes were more robust for the PG group; however, there were no differences in the intensities of the subjective responses of the control subjects to the happy, sad, or gambling scenarios. These findings suggest that the 3 scenarios were of comparable interest to the control group and that the gambling scenarios had greater salience for the PG group. The greatest between-group difference in subjective reports was that of the intensity of gambling urges when viewing the gambling scenarios. These findings indicate that despite the space and sound limitations that accompany fMRI, the gambling scenarios were effective in eliciting gambling urges in PG subjects and that this state was rarely observed in control subjects. Robust differences in brain activity between PG subjects and controls viewing the gambling scenarios were observed before the reported onset of emotional or motivational response. Men with PG showed decreased activity in frontal cortical, basal ganglionic, and thalamic brain regions compared with controls. Increased activity in cortico-basal-ganglionic-thalamic circuitry has been described in general in OCD,6 and specifically during symptom provocation.28 These findings suggest that PG and OCD subjects are on opposite ends of control subjects in disorder-specific, cue-induced cortico-basal-ganglionic-thalamic activity. These differences could reflect clinical characteristics of the groups, for example, greater tendencies in OCD for excessive predecision contemplation and in PG for minimal predecision contemplation. The extent to which deficits in this neural pathway exist in nonurge states in PG subjects and the extent to which activity within this circuitry correlates with behavioral characteristics distinguishing PG and OCD subjects21 require direct examination. The generation of internal, emotional states has been proposed as important in making appropriate decisions.29 Decision-making processes regarding choice selection in gambling paradigms have been shown30,31 to involve anticipatory processes (as measured by skin conductance) that operate before subjective report of an understanding of the rational basis for choosing one option over another. Individuals with PG, CD, and OCD have been shown to perform disadvantageously on these gambling tasks,22-25,32,33 and individuals with substance dependence do not generate as robust skin conductance changes before gambling choice selection.31 It will be important to examine directly the neural correlates in individuals with PG compared with controls and other patient groups of decision-making processes relating to gambling and to determine the relationship between structured measures of impulsiveness and brain activities associated with decision making in these groups. However, the temporal similarity of physiologic abnormalities early in the experimental decision-making process and fMRI abnormalities before the reported onset of emotional or motivational response suggest a possible relationship between the two. The presence of between-group differences at the earliest presentation of gambling cues, and before the onset of the conscious urge to gamble, shows the importance of physiologic response measures in identifying pathologic responses and the challenge posed to afflicted individuals who experience pathophysiologic responses before conscious awareness of a desire to engage in pathologic behaviors. A similar phenomenon was observed for CD subjects viewing cocaine scenarios.8 However, the nature of the activity differences during this initial period of videotape viewing was different in CD and PG subjects; for example, activation of ventral and dorsal AC was observed in the E0-B1 period in CD subjects.8 The extent to which brain activity differences in PG and CD subjects viewing disorder-related cues reflect the effects of acute or chronic drug exposure or differences in the inherent pathogenesis remains to be investigated directly. Such studies would not only advance the understanding of the neural correlates of addictive processes but also provide a rationale for targeted treatment strategies. The E1-E0 comparison is linked to the reported onset of an emotional or motivational response.8 In contrast to other epochs, PG subjects generally showed relatively increased brain activity compared with controls. As previously shown,8 changes during this epoch were in part in the opposite direction as those occurring in the E0-B1 epoch. Activity changes followed different temporal patterns in the PG and control groups; for example, superior frontal gyral activity increases occurred during viewing of the happy scenarios in the E1-E0 epoch for the PG group and in the E0-B1 epoch for controls. Distinct temporal patterns of brain activity changes were also observed in the CD and control groups.8 Together, these findings indicate that PG subjects and controls differ in the neural correlates of subjectively observed emotional states and that there exist neural correlates of affective dysregulation independent of disorder-specific urges in PG and CD groups. The extent to which these findings reflect between-group differences in subjective awareness, attention, and other aspects of neural processing requires further examination. The E2-B2 comparison focuses on brain activity during the culmination of the scenario and, for the gambling scenarios, includes the most provocative gambling stimuli. The finding that PG subjects and controls were distinguished solely by activity in the vAC during the E2-B2 epoch is important for several reasons. First, increased activity was observed in CD subjects in this brain region, indicating a difference between PG and CD subjects during this epoch of viewing disorder-specific stimuli.8 The cause of this difference is unclear; for example, the findings might be attributable to the effects of long- or short-term exposure to cocaine or differences in brain structure or function independent of drug exposure. Second, alterations in mood have been associated with changes in activity in the vAC, with decreased activity associated with positively valenced mood states.34 The extent to which the relatively decreased activity in the vAC of PG subjects during viewing of the gambling scenarios reflects a positively valenced mood state requires further examination. Third, the vAC has been implicated in decision-making processes that hold relevance in the consideration of appetitive urges.35,36 The somatic marker hypothesis posits that the generation of emotional states is critical to the selection of choices advantageous for future consequences, and data from accidentally injured (eg, Phineas Gage), stroke-lesioned, and substance-dependent patients implicate the ventromedial prefrontal cortex.31,33,36,37 These findings suggest that the lower activity in PG may be linked to disadvantageous decision making with regard to contemplating engagement in gambling. Fourth, decreased activity in the ventromedial prefrontal cortex (defined38 as including the vAC and medial OFC) has been associated with increased impulsiveness. 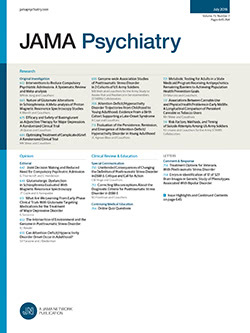 Studies of imaginal aggression in healthy individuals found decreased activity in the ventromedial prefrontal cortex,39 and individuals with intermittent explosive disorder demonstrate abnormalities in cognitive (gambling task performance) and behavioral (odor identification) indirect measures of OFC function.40 Serotonergic challenge with fenfluramine hydrochloride or meta-chlorophenylpiperazine has been associated with relatively decreased activity in the vAC and medial OFC in individuals with impulsive aggression.41,42 Abnormalities in behavioral and neuroendocrine response to meta-chlorophenylpiperazine in PG and other subject groups characterized by impaired impulse control, together with clinical responses to selective serotonin reuptake inhibitors in PG subjects, further implicate frontal lobe serotonin pathways in the pathologic process of PG.43,44 Future studies are needed to determine the nature of ventromedial prefrontal cortex function in PG and the extent to which it changes during or predicts response to specific forms of treatment for PG. Corresponding author and reprints: Marc N. Potenza, MD, PhD, Connecticut Mental Health Center, 34 Park St, Room S-104, New Haven, CT 06519 (e-mail: marc.potenza@yale.edu). Submitted for publication October 3, 2002; final revision received December 20, 2002; accepted January 14, 2003. This work was supported by a Young Investigator Award from the National Alliance for Research in Schizophrenia and Depression, Great Neck, NY (Dr Potenza); Drug Abuse Research Scholar Program in Psychiatry Award K12-DA00366 from the American Psychiatric Association, Washington, DC, and the National Institute on Drug Abuse, Bethesda, Md (Dr Potenza); the National Center for Responsible Gaming, Washington (Dr Potenza); grants P50 DA09241 (Dr Rounsaville) and K05 DA00089 (Dr Rounsaville) from the National Institute on Drug Abuse, and grant K02 MH01296 from the National Institute of Mental Health, Bethesda (Dr Wexler); and the New England Veterans Administration Mental Illness Research Educational and Clinical Center, Washington. We thank Hedy Sarofin, Cheryl McMurray, Terry Hickey, and Erin Reutenauer for technical assistance and Stephanie O'Malley, PhD, and Christopher Armentano for helpful suggestions.